Were Hedge Funds Right About Selling AT&T Inc. (T)? Hedge fund managers like David Einhorn, Bill Ackman, or Carl Icahn became billionaires through reaping large profits for their investors, which is why piggybacking their stock picks may provide us with significant returns as well. Many hedge funds, like Paul Singer’s Elliott Management, are pretty secretive, but we can still get some insights by analyzing their quarterly 13F filings. One of the most fertile grounds for large abnormal returns is hedge funds’ most popular small-cap picks, which are not so widely followed and often trade at a discount to their intrinsic value. In this article we will check out hedge fund activity in another small-cap stock: AT&T Inc. (NYSE:T). Is AT&T Inc. (NYSE:T) undervalued? Prominent investors are becoming less hopeful. The number of long hedge fund bets decreased by 14 lately. Our calculations also showed that T isn’t among the 30 most popular stocks among hedge funds. T was in 56 hedge funds’ portfolios at the end of December. There were 70 hedge funds in our database with T holdings at the end of the previous quarter. We’re going to take a look at the new hedge fund action surrounding AT&T Inc. (NYSE:T). How are hedge funds trading AT&T Inc. (NYSE:T)? At Q4’s end, a total of 56 of the hedge funds tracked by Insider Monkey were long this stock, a change of -20% from the second quarter of 2018. 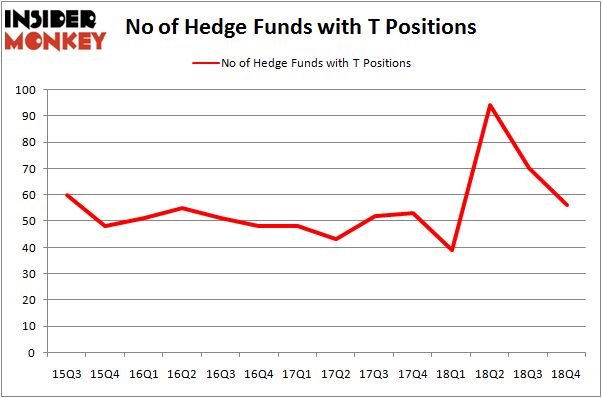 The graph below displays the number of hedge funds with bullish position in T over the last 14 quarters. So, let’s review which hedge funds were among the top holders of the stock and which hedge funds were making big moves. Of the funds tracked by Insider Monkey, Ken Griffin’s Citadel Investment Group has the biggest position in AT&T Inc. (NYSE:T), worth close to $432.1 million, amounting to 0.2% of its total 13F portfolio. On Citadel Investment Group’s heels is D E Shaw, led by D. E. Shaw, holding a $277 million position; 0.4% of its 13F portfolio is allocated to the company. 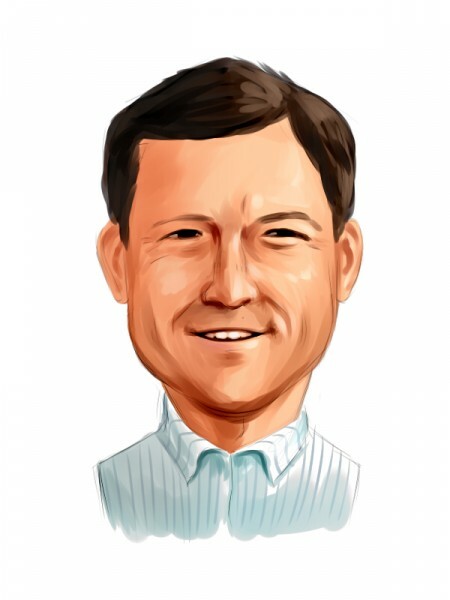 Other hedge funds and institutional investors that are bullish include Phill Gross and Robert Atchinson’s Adage Capital Management, John A. Levin’s Levin Capital Strategies and Cliff Asness’s AQR Capital Management. Judging by the fact that AT&T Inc. (NYSE:T) has witnessed bearish sentiment from the smart money, it’s easy to see that there was a specific group of hedge funds who sold off their entire stakes by the end of the third quarter. Intriguingly, Michel Massoud’s Melqart Asset Management said goodbye to the biggest position of all the hedgies tracked by Insider Monkey, valued at an estimated $146.3 million in stock. Jim Simons’s fund, Renaissance Technologies, also said goodbye to its stock, about $128.8 million worth. These transactions are intriguing to say the least, as total hedge fund interest fell by 14 funds by the end of the third quarter. Let’s now take a look at hedge fund activity in other stocks – not necessarily in the same industry as AT&T Inc. (NYSE:T) but similarly valued. We will take a look at The Coca-Cola Company (NYSE:KO), Merck & Co., Inc. (NYSE:MRK), Novartis AG (NYSE:NVS), and China Mobile Limited (NYSE:CHL). All of these stocks’ market caps match T’s market cap. As you can see these stocks had an average of 42.25 hedge funds with bullish positions and the average amount invested in these stocks was $7042 million. That figure was $1851 million in T’s case. Merck & Co., Inc. (NYSE:MRK) is the most popular stock in this table. On the other hand China Mobile Limited (NYSE:CHL) is the least popular one with only 14 bullish hedge fund positions. AT&T Inc. (NYSE:T) is not the most popular stock in this group but hedge fund interest is still above average. This is a slightly positive signal but we’d rather spend our time researching stocks that hedge funds are piling on. Our calculations showed that top 15 most popular stocks among hedge funds returned 19.7% through March 15th and outperformed the S&P 500 ETF (SPY) by 6.6 percentage points. Unfortunately AT&T wasn’t in this group. Hedge funds that bet on AT&T were disappointed as the stock returned 9.2% and underperformed the market. If you are interested in investing in large cap stocks, you should check out the top 15 hedge fund stocks as 13 of these outperformed the market. Were Hedge Funds Right About Novartis AG (NVS)? Here is What Hedge Funds Think About Cisco Systems, Inc. (CSCO) Were Hedge Funds Right About The Coca-Cola Company (KO)? Should You Buy The Boeing Company (BA)? Do Hedge Funds Love Taiwan Semiconductor Mfg. Co. Ltd. (TSM)? Were Hedge Funds Right About Merck & Co., Inc. (MRK)?